Twenty seven years ago Waterlooville’s Good Neighbours group came into being, largely through people at St George’s, and although there is now no direct link to St George’s the group continues to flourish and help those in our area, and indeed has expanded to cover Cowplain and parts of Purbrook. Today the group has over thirty members who shop for people, assist them with their shopping, take them to medical appointments or visit them at home. In fact, in each of the last few years the group has done well over 1000 tasks, helping 90 residents of the area. 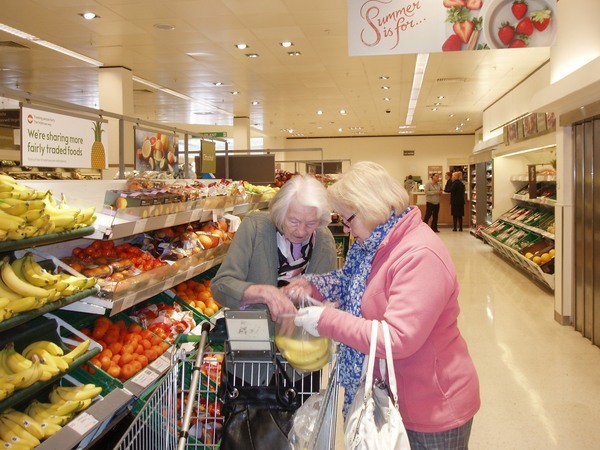 As an example, one of our volunteers takes a lady shopping every week. As the lady is almost blind she needs assistance reading labels – and looking out for ‘special offers’! Another volunteer takes a gentleman to the Stroke Club at The Woodpecker every week. One of our longest standing members does the shopping for a lady who can’t get out, and has done so for years. Many of our volunteers take people who struggle with taxis or public transport to QA outpatients. They may all be small tasks, but they all make life easier for someone, and that’s what it’s all about. The current Chairman, Simon Molyneux, foresees an increasing need for the sort of help provided by the group because of the growing number of elderly people. That alone would increase demand, but is compounded by the financial constraints on the capacity of publicly funded assistance such as that provided by social services. It is further compounded by social trends such as families being far more geographically separated than with previous generations, meaning that they are less able to travel to help their parents. In many cases we find that children would like to be more involved but are still working themselves and bringing up their own families. There is also a parallel social trend where grandparents are playing a growing role in helping out with their grandchildren, yet just as financial constraints on the public purse mean that volunteers are more sought after, those who have traditionally been volunteers in the community are busier than hitherto. The Chairman and Secretary of the group are resigning in the Spring this year, after ten years in post. The committee is now looking for someone to replace them to enable the group to continue, and would like to hear from anyone interested in helping out. Finally, as always, if you know anyone who might appreciate a helping hand from time to time, please ring 02392-266005 to contact the group.